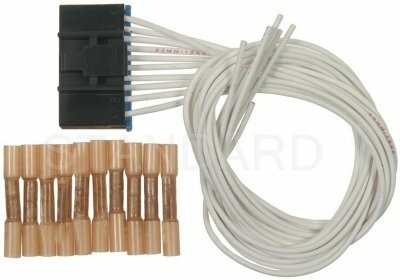 If you have trouble with your 7x6/5x7/H6054 LED hedlight not working properly, problems such as dim headlights, malfunctioning headlights when using hi/lo beam, this H4 headlamp relay harness below can fix, please buy this if your car suffer from these problem, especially for Toyota Tacoma series. 3.The harness is equipped with a 30A fuse. Connect the red cable coming out of the fuse to the positive (+) side on your battery. 5.Connect the ground cables in each of the yellow plugs to the body of the car. You can use existing bolts or self tapping screws but verify that you have a good ground. Connect the yellow plugs in the harness to your headlights and test your low and high beams. Once you have successfully tested your lights, you can dress the harness properly to the body of the vehicle. Attach the relays to the body of the vehicle as well and verify the harness is not pinched, all bolted terminals are properly tightened and all plugs are fully connected. 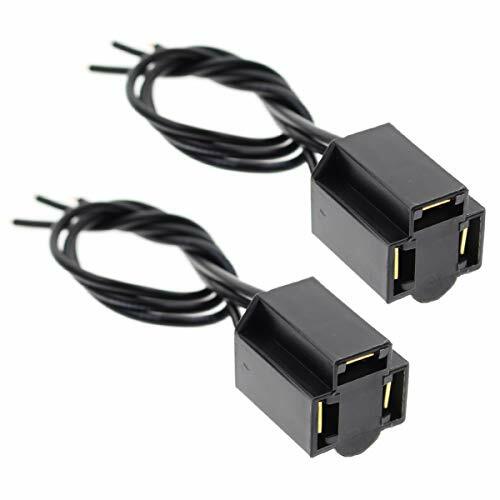 This 1set 2-headlights h4 headlight relay harness Fixes cars with 2 pcs H4 plug headlamps, such as 7x6 led headlights. 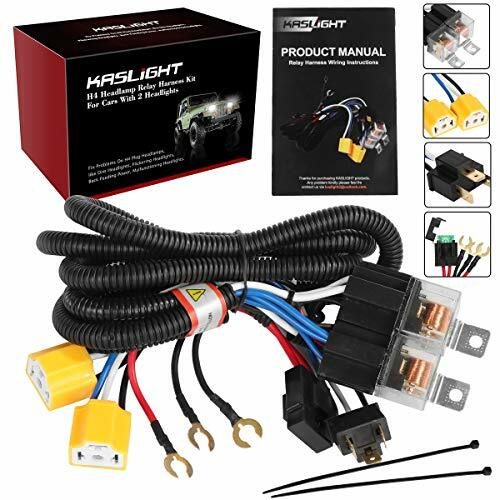 Problems like Dim Headlights, Flickering Headlights, Back Feeding Power, Malfunctioning Headlights when using Hi/Low Beams can be fixed with this kaslight 2-headlight h4 headlamp relay. Make a big improvement for visibility on your cars at night. IMPORTANT NOTICE As Toyota Pickup and Toyota Tocoma use a double ground which leads to the headlights not work or only one beam work, this Harness is a must to fix the problem. It may be still complicated to wire in some new relays to run the headlights properly, TAKE IT EASY, it is not the issue of product quality, only because wiring circuit of Toyota series is a little complicated. Perfectly match KASLIGHT H6054 6054 7X6 led headlights 1992 toyota pickup led headlight harness. Also fixes: Overloading the Headlight Switch, Overheating Plugs. If you are upgrading to Halogen Bulbs or are having trouble with your 7x6, 4x6, 5-3/4 or any other H4 plug headlights not working properly, this is your fix!! 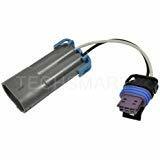 Package includes one set h4 socket led headlight relay kit. Please pay attention to the operating circumstances. Keep the wiring harness away from any moist or heat, such as rain, moisture environment, electro-heat equipment (engine and etc.). 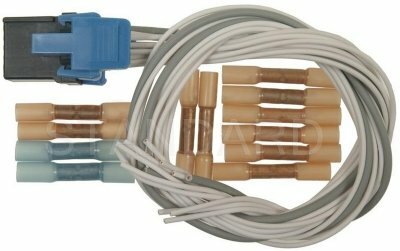 Light bar wire harness up to 180 watt load capacity, it is universal fit for any 7 10 12 20 30 40 light bars that is within 180w. 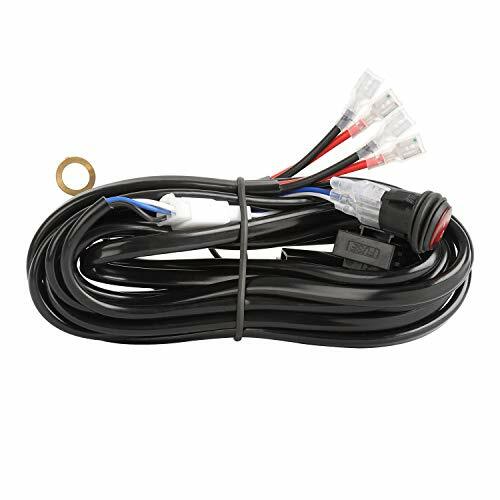 LED Wiring harness kit with 2 lights output connection,it can hook with 2 small watt led light bar and any else off road led lights. DC12V 40A rated automotive relay can be assembled with a DC 24V relay (not Supplied). Blade fuse holder with replaceable 30A Fuse up to 2M of wiring, terminal ends on most wires. 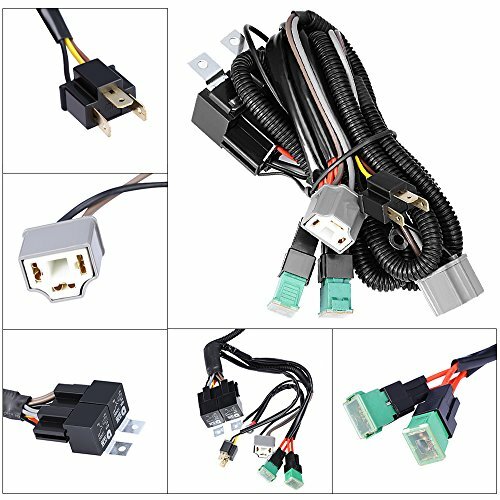 Apply to off-road driving light,fog light, work light etc.This wiring harness is a basic accessory for off-road vehicles, working vehicles, automobiles and boat that use a 12V DC power source. Compatible with power source 12 Volt DC. Now at a incredible price. Get the advantages of LED light for your ride. Primarily designed for motorcycles but works well for automotive applications. Keep your existing custom headlight and just replace the bulb. Fits majority of H4 applications. Includes 4 adapters for many make/models. Bright White Beam, 6000K Superior color contrast in all road conditions LED Technology Low power draw will not drain battery 20,000 Hours Life Active Heat Management System DIY Installation Simple retrofit kit Built in ballast Wide Operating Voltage Remains bright regardless of battery condition Hi/Lo Dual Beam 2,500 Lumens high beam output. Drop-in replacement for most Harley Davidson model years 1992 and newer. Not well suited for HD 5 3/4" housings with 3-bolt-mounted bracket and 5 3/4" housings with rubber spacer inside. 7" HD housings that bulb is secured with spring clips: May have to remove bulb adapter set screw, place spring, then replace the bulb set screw. Consult your vehicle user manual for type of bulb and the fittings. 1 year limited manufacturer warranty. Not DOT approved. Designed according to DOT specifications. 16 Gauge wire, high efficient copper wiring. Nylon plug (can withstand up to 1200 Fahrenheit). Heavy duty, High efficient, Heat resistant, Never melt. 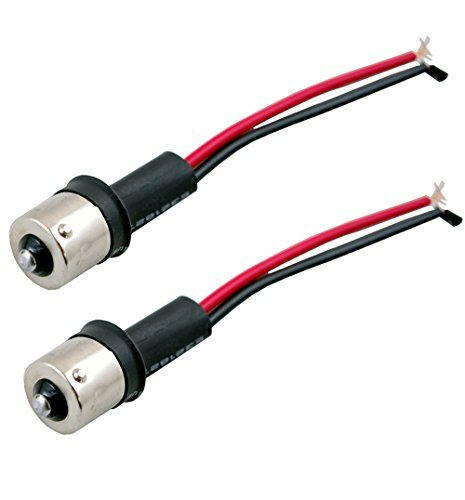 This auction features one pair brand new 1156 male adapters with 2-wire extension. Pre-Wired Socket for Easy Installation. Please Make Sure the Adapter is the same as your stock to ensure proper fitting. Note: The cable color of this product will be sent in random. 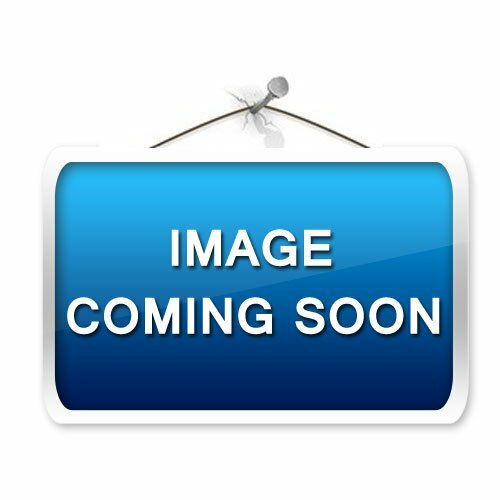 Universal GM 3 Wire Headlight Connector H4 9003 3 Prong Sealed Beam Headlights. Use with Universal 3-Prong Sealed Beam Headlights. For Use with Bulbs 9003 and H-4. Use with 3-Prong Flashers. Three 18 Gauge Leads. These get very hot, do not mount on plastic! If you have a Bi-xenon Kit, you could install one on both sides of your vehicle as well. One side nothing will connect to this module. Fits H13 HID kits and LED Kits. 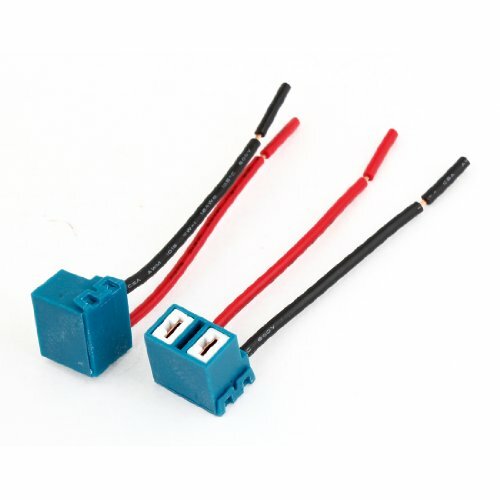 Connects between Vehicle H13 plug and your kit. May not work with all vehicles. These get very hot, do not mount on plastic! May need to cut off one resistor on some vehicles. Some vehicles may only need 1 on the side where no bulb is connected. 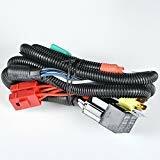 BEEYEO Heavy Duty Led Light Bar Wiring Harness 2-lead utilizes copper 12-Gauge wires and weatherproof spade connectors for up to 600W high-power led lights connections. 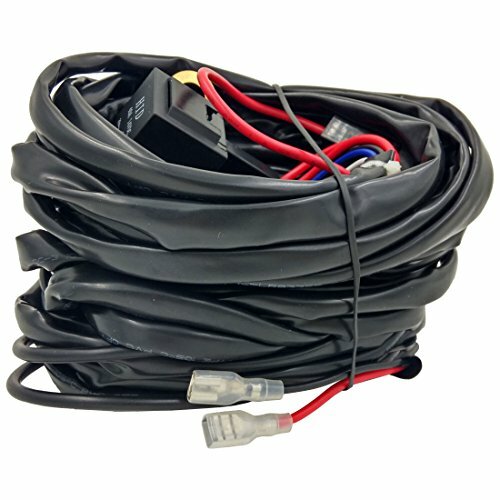 The whole harness is almost wrapped by a very heavy vinyl cover, with a waterproof inline fuse and reliable 40amp relay, well protecting the circuit against voltage spikes, heats and even burnouts.It compatible with all automobiles,Boats and devices equipped with a 10-30v power source. 4. Turn on on/off button of switch to test the lights bar. 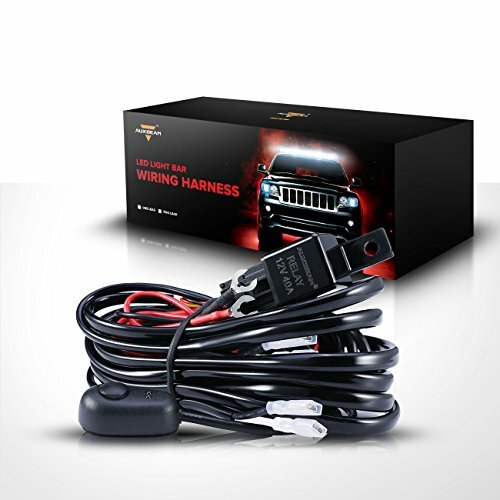 - Professional installation of this HD+ series wiring harness is highly recommended! - All the exposed wires needed to be wrapped by electrical tape to avoid a short circuit. - Please make sure that the total power of dual light fixtures is not exceed 600W, or it would get melt. - Please allow 1-3cm error due to manual measurement. Thanks for understanding. Enhanced Quality - The BEEYEO LED Light Bar Wiring Harness features heavy duty 12 gauge wires with waterproof thermoplastic PVC jacket that for better performance. Easy Installation - Using Red and Black color code for easy hook up, this harness is flexible enough for mounting. Easily connects any lighting accessory to its power source by tapping into the battery directly. 3 pin on/off switch with red indicator light when truing on, easy to turn on or off, has been passed test of 5, 000 times pressing. TWO AVAILABLE LEADS: With 2 sets of light output connectors for dual lighting fixtures less than 500W, the connection is more stable.12FT Extendable Wiring Harness:up to 12ft of wiring that is plenty of length to put it where you want. 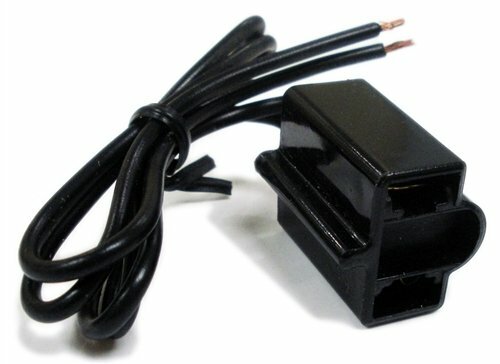 We recommend professional installation,pls let professinal installer to wire the harness kit; If let the wire short circuit,the harness would melt and even caught a fire,We suggest that wrap all exposed wire with electrical tape to avoid a short circuit; Pls make sure your light within power 600W, or it would got melt as well. 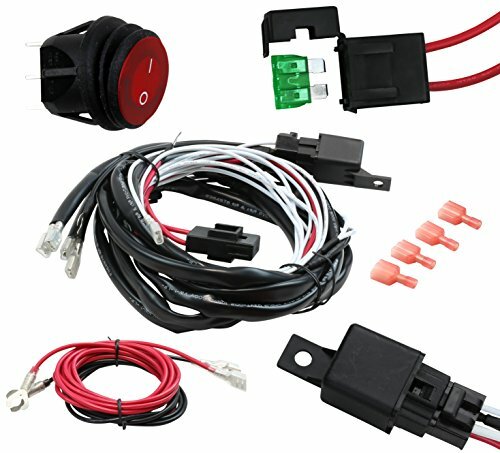 This listing features one pair of 9005 / 9006 relay harness for solving the issue of flickering or error code when you upgrade the stock halogen headlamp to led headlight.A harness maybe necessary when installing LED headlights, whether it's due to low voltage DRLs, flickering from automatic headlights, CAN-Bus systems, or just weird unexplained issues. 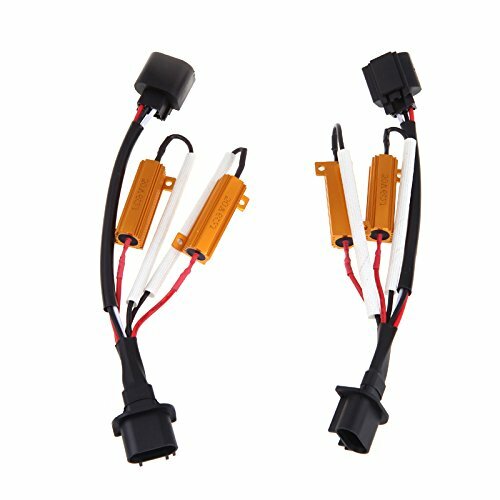 HD waterproof relays with mounting brackets;Daytime running light ( DRL) anti-flickering harness. Common ground connection (at the battery); Cross reference number: 9005, HB3, 9005LL, 9006, HB4, 9006LL, 9145, HB10, 9055, 9040, 9140, etc. 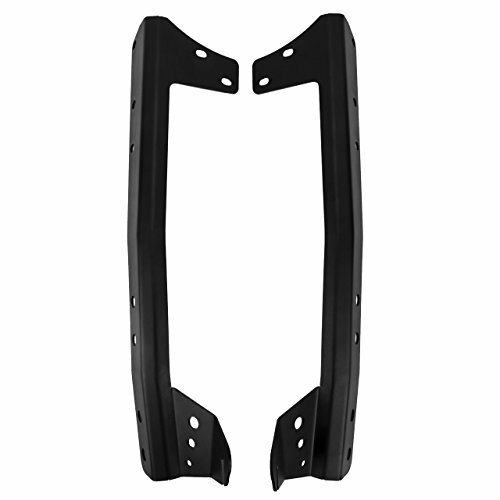 With excellent performance and superior quality, there is no doubt that Eyourlife 52 inch LED Light Bar Upper Windshield Bracket is your best choice for adding our top-ranking lighting system to your Jeep. With modern, aesthetic appearance and unexpected endurance, this upper windshield mount will hold 52" Light Bar in the top of your Wrangler stably,spanning the entire width of the roof and giving a killer look.Fits any standard 52" Off-Road Curved light Bar. 100% fit for jeep wrangler windshield frame, best compatible with your Led light bar! 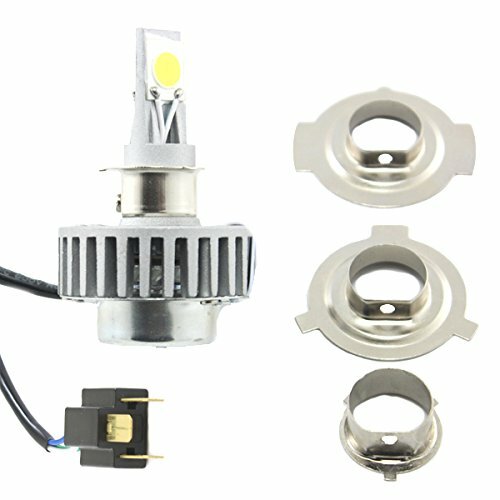 Upgrade to higher wattage for halogen bulbs, fix any trouble of 7" headlight. Pre-Wired for Plug and Play. No need to modify the stock wires at all. Dual (High/Low) beam bring more convenience when controlling the light. * Please Read All Description and Fitment Before Ordering the Product. DURABLE - Made of hihg quality PE pipe,anti-aging, corrosion-resistant, heat-resistant high-frequency ceramic material, never melt. CONVENIENCE - No error when installing HID conversion kit,pre-wired for plug and play, no need to modify the stock wires at all,easy to controll the light. MORE SAFETY - The built-in fuse and two 40A waterproof relays can efficiently protect the circuit when high working current occurs. Control the power of your new light accessory without having to splice wires. CoolYeah LED Light Wiring Harness easily connects any lighting accessory to its power source by taping into the battery directly. 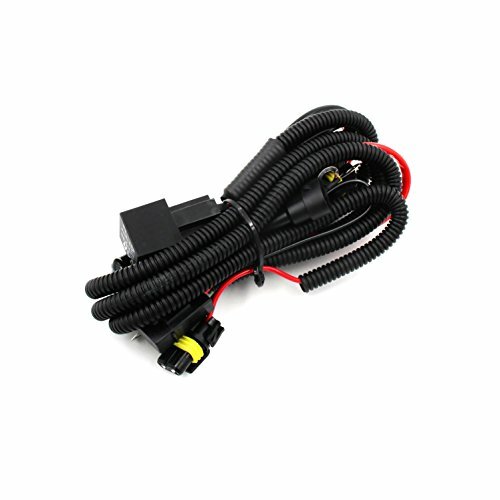 CoolYeah LED Light Wiring Harness is compatible with all vehicles or boats that use a 10-30v DC power source. Basically any car battery will work on this wire harness. Just connect your lights to your batter and flip the switch. 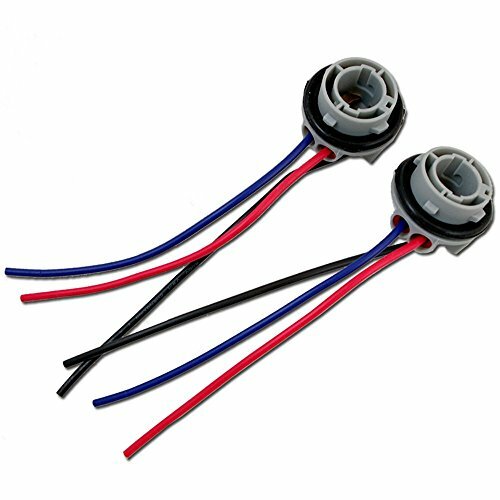 The length of this CoolYeah Wire Harnesses will allow you to mount your LED light to nearly anywhere you want. Just run the harness from the battery to your desired lighting location. LED Lights are expensive and in all cases should be protected against early burnouts. CoolYeah Wiring Harnesses achieve this by using silicon infused 14 American Wire Gauge (AWG) cables that better control against voltage spikes and heat. The last line of defense against is the included relay and fuse. CoolYeah Wire Harnesses are IP 67 rated and can withstand any rain and moisture while still powering on. Ideal for outdoor use, CoolYeah Wire Harnesses are for those looking for a heavy duty harness that's as rugged as their 4x4/ATV/Sandrail.